Artificial photosynthesis is the phrase coined by Professor Michael Graetzel to describe the function of a dye-sensitized solar cell. 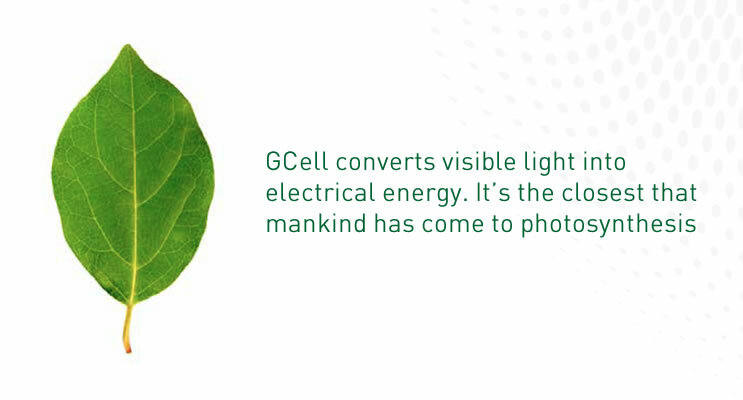 Just like a leaf, GCell harvests the power of light and transforms it into fuel replicating nature at its finest. Many new scientific technologies are seeking a new route to produce a clean fuel without generating any harmful by-products, like greenhouse gasses. Artificial photosynthesis, or AP as it is sometimes referred to, has the potential to produce fuels for transport in the form of Liquid Hydrogen (LH2) and carbon based fuels for industry such as Methanol (CH3OH). GCell uses artificial photosynthesis mimic nature and generate electricity supplying it direct to a product application for storage or immediate use. Using the energy available in sunlight, and particularly the recycling of indoor light, is an untapped resource that few technologies have been able to successfully get to grips with. Replicating what happens naturally in green plants is not a simple task. The evolution of plants took billions of years to develop an efficient photosynthesis process; creating that synthetic photosynthesis system requires significant research, development and innovation. GCell has succeeded in replicating natureâ€™s photosynthesis with breakthroughs in physics, chemistry, materials science, and nanotechnology to create new business opportunities in indoor and portable energy harvesting product applications where classic silicon-based photovoltaic technologies cannot be used. GCell makes the process of artificial photosynthesis efficient, inexpensive, and robust. Owing to its ability to take advantage of low-light or diffuse light conditions, GCell has the potential to cover a wide range of different market segments not accessible by other photovoltaic technologies. Indoor, portable and/or wearable energy harvesting applications are now possible thanks to the process of artificial photosynthesis created by GCell and its promise of smart, sustainable, solar. For more information on GCell and its suitability for indoor, portable and wearable purposes visit Applications.